A prairie warbler pauses briefly in its hunt for insects along a powerline cut. Around here it’s the season for migrating warblers from mid-April through the end of May, and among the loveliest to hear singing are prairie warblers. We don’t exactly live on a prairie, but they come to breed in our area. What’s a warbler, anyway? Warblers are small, active, insect-eating birds with slim, sharply pointed beaks. Taken together, the males don’t necessarily warble, but they sing a great variety of different songs, from trills to buzzes. It can be great fun to hear almost any of them. Most males are brightly colored for the breeding season, making them a treat to see, but warblers are a challenge – quick and hard to spot as they dart around, foraging for insects. Prairie warblers (Setophaga discolor, Dendroica discolor) are small – only about 4-1/2 inches long – and mostly yellow. Both male and female prairie warblers have yellow on their face, chest, belly and rump. They also have streaks on their sides – black in males, olive in females - and an olive back. The male’s colors are brighter. Where might you find prairie warblers? You don’t need to look for a prairie or grassland. (The name prairie warbler is a misnomer. Apparently the bird was named after a place that the local residents simply liked to call a “prairie.” A less romantic but perhaps more accurate name that’s been suggested for the bird is “scrub warbler.”) The prairie warbler makes itself at home in shrubby areas (or “scrub”) such as overgrown clearings, fields, and pastures, as well as powerline cuts and sandy, brushy environments. 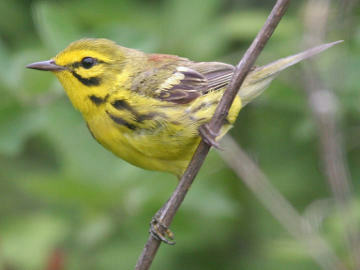 In the weeks ahead, you might hear prairie warbler song near the driveway and parking lot at the YMCA Boroughs Family Branch (Westborough), or in the powerline cut behind Shrewsbury High School, or along the powerline trail at nearby Broad Meadow Brook Audubon Sanctuary (off Rt. 20 in Worcester). In Massachusetts, prairie warblers are near the northern limits of their usual range, but they’ve gradually been pushing northward into New Hampshire along power line cuts. The overgrown clearings that these little birds favor only last for a while. Not only do the areas sometimes get developed, but these environments also gradually disappear as they turn into woodlands. Power companies, however, make a point of combating this natural change as they maintain their powerline cuts, and in the process they provide a home and highway for prairie warblers. The summer nesting season is short for prairie warblers in our area. They typically raise one brood of chicks and start moving south toward the West Indies by August, or even sooner. On this trip they sing less and their colors are dull. Let’s enjoy these singers and their song while we can.